What lasts longer than an eight second ride? Eight seconds is a long time for a bull rider to stay on a bull's back, but it's a really short time for reading a good book. I'm really pleased to share the release of BROKEN! I have to admit. I do love the cowboys. Maybe you like them, too? And I hope you read for a lot longer than eight seconds! 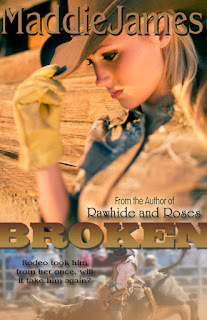 In BROKEN we have a bull riding cowboy who comes home after being gone for some time, only to find out that the girl he'd left behind has grown up. Complications abound! BROKEN is available at Amazon Kindle . Barnes and Noble . All Romance Ebooks . Bookstrand . Smashwords and at the Turquoise Morning Press Book Store. Watch for BROKEN to come available in print, and also soon to Sony, Apple, Diesel Ebooks, and Kobo!